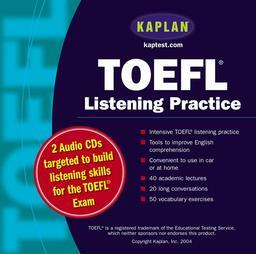 This audio CD is an excellent tool for any and everyone getting ready for and aiming at the TOEFL test. It provides both trainers and students working on their own with a wide and extensive range of listening material typically found in the listening section of the TOEFL test. Some of those preparing for international exams such as the TOEFL need extra practice for the listening section and it is not that easy to find supplementary material focusing on that specific aspect. As an experienced trainer in the corporate and academic (international exams) world, I strongly recommend this as very good supplementary material, for TOEFL preparation or even for those interested in improving their listening skills in American English. However, I should say that the reason why I gave it 4 stars and not 5 is because it does not come with any scripts or accompanying exercises, which would definitely optimize the recorded material and its results. Therefore, trainers should develop their own activities in order to maximise results.